Color patterns on the heads of birds are some of the most complex, and also some of the most important for identification. Understanding those patterns is significantly easier if you learn the five major groups of head feathers, since the contours of the feathers define most of the color patterns shown by birds. In the photo below, you can see these feather groups and how they relate to the color patterns. 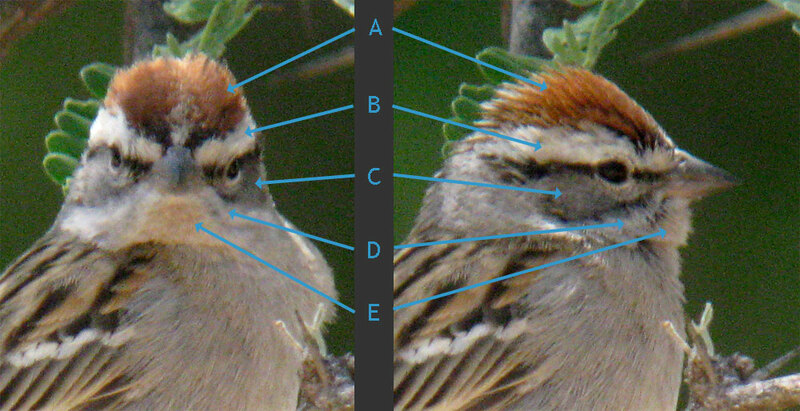 To recognize these feather groups even on a species where they are all the same color, look for subtle “creases” where feather groups meet, and for the different planes of the head. For example, the feather group labeled D below is broad when viewed from the side but appears narrow (foreshortened) when viewed from the front. Photos from Patagonia, AZ, May 2011; copyright David Sibley. This can also be called the eyebrow (but that would have been too easy). I actually prefer the term "eyebrow stripe" when referring to a contrastingly colored stripe. In this case the pale eyebrow stripe covers essentially the whole supercilium, but in other species the pale eyebrow stripe can be broader or narrower (with more pale feathers than this, or fewer). This feather group has a confusing history of names. Many other modern field guides call it the "submoustachial stripe", and use "malar stripe" to refer to a dark line just below these feathers. In the Sibley Guides I call it the malar feather group (like older field guides and most ornithology texts), but to escape the confusion I may need to rethink the name. This feather group is simple, easily recognized, and well-named. Notice how all of the feathers grow up and straight back, lining up in rows that form the crown stripes shown by so many species. Like the crown, this feather group is well-named and easy to recognize. It spans the underside of the lower jaw. These are also known as the "ear-coverts", and are a very complex bunch of feathers that can be subdivided into multiple groups. On this bird, the auriculars are dark along the top edge (the eye line), and the bottom edge just below the eye (the moustachial stripe). The area between the eye and the bill is called the lores. Rufous-winged Sparrow would have a grayish supercilium (not white), rufous line behind the eye (not blackish), and a prominent dark lateral throat stripe just below the malar. American Tree Sparrow would also show a grayish supercilium and rufous eyeline, as well as a bicolored bill. House Sparrow and White-crowned Sparrow differ in many ways. Heh, this is the first one I’ve managed to get perfect on the first try. These quizzes are excellent and I’m learning a lot. Keep ’em coming! The quizzes are great. I like the information given at the end of the answers. Great stuff!!! I was sent here by a fellow blogger DawnFine and I am hooked. Got em all except the last one. That’s one of the reasons I’m here.